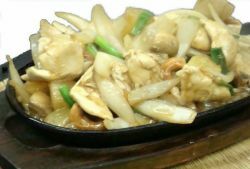 Sauteed of sliced chicken breast with house special sauce, roasted cashew nut, onion, pineapple, mushroom and scallions. Thin sliced of marinated beef deliciously stir-fried with onions, mushrooms, scallions and sesame seed. 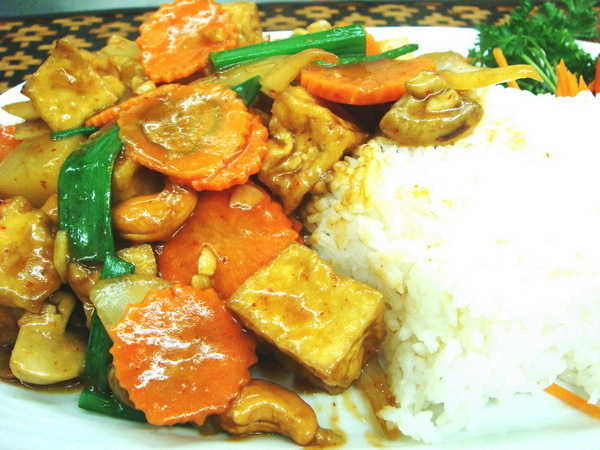 Freshly minced chicken stir-fried in a chili sauce with bamboo shoots, carrots, string beans and basil leaves. Stir-fried tofu with onions, carrots, pineapple, mushrooms, scallions, cashew nuts in mild chili paste. 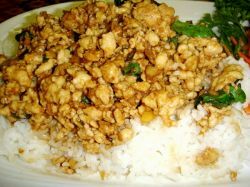 Traditional spicy basil chicken dish. 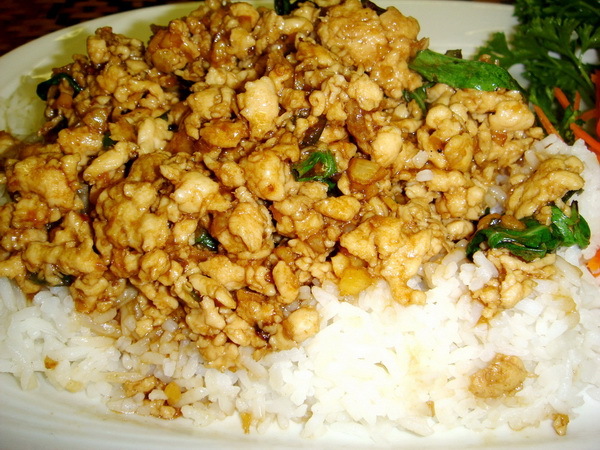 Minced chicken sauteed with resh hot chili, garlic and basil leaves. Creamy coconut milk cooked with Panang curry, string beans, snow peas, red peppers and Thai herbs. Marinated pork and beef with hot sweet-sour sauce, zucchini, yellow squash, onion, mushroom, pepper, carrot, tomato, scallion. 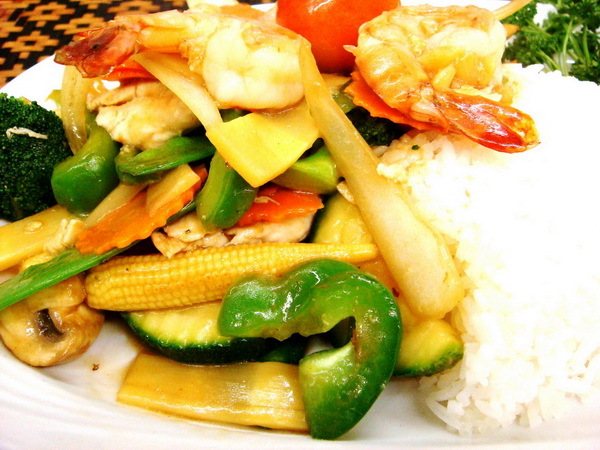 Stir-fried shrimp & chicken with assorted vegetables in a light oyster sauce. 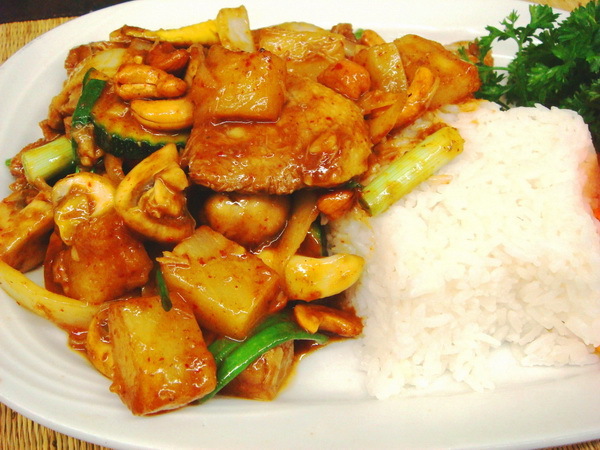 Sauteed tender squid with basil, peppers, onions, green peas, carrots and mushrooms in hot chili sauce. 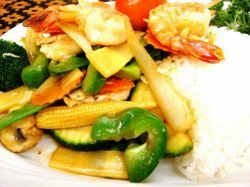 Stir-fried large shrimp with onions, pineapple, zucchini, carrots, baby corn, mushroom, yellow squash, snow pea, tomato, cashew nuts in special sauce. 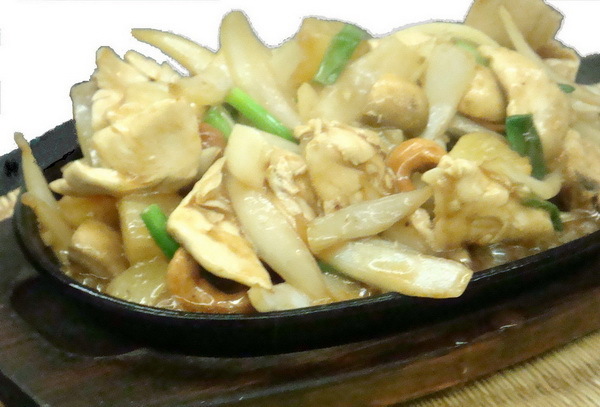 Seafood assortment sauteed with green pea, onions, mushroom, red & green peppers and sweet basil leaves in hot chili sauce. A combination of shrimp, chicken, beef and pork stir-fried with string beans, peppers, carrot and cashew nuts in tangy chili paste. Large shrimp tossed in tradition Thai spices. Quick stir -fried with a touch of yellow curry, onion, pineapple, scallion and egg. 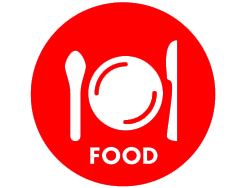 Sliced of roasted duck sauteed with red & green peppers, onions, carrots, mushrooms, baby corns, string beans, basil leaves in Thai hot chili paste. Rice soft noodle with shrimp, sea scallop, mussel, squid, imitation crab meat, tuna, scallions and bean sprouts in coconut milk and red curry sauce.